Every con is filled with celebrities in various themes. There are movie and TV personalities, writers, artists, musicians, scientists, puppeteers and other professionals. Moving anywhere through out the con you will bump into any number of people. Now, they might be a 'celebrity' in an area that you are not familiar with so you might not know who they are. Everyone, and I mean everyone who has attended con has at least one celebrity story. Attend many years of con and you will have many stories. Here is one of my many stories. One day I was in the Hilton on my from the ground floor to the second and all of a sudden there was a shout and a blur. I was in a queue to get on the escalator. The queue paused and stepped back. There was a group of people coming at us pretty quickly. All of a sudden someone breaks from the pack and takes a running leap onto the escalator. 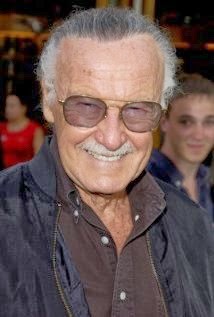 As I am in watching I see and 80+ year old Stan Lee laughing and looking back down at us. HOLY COW...not only did someone just do that, it was Stan freaking Lee.